We are pleased to announce Dr. Eva Ramos will be giving a technical presentation at the forthcoming European Coatings Show, in Nuremburg, Germany. She will be presenting SnowPack, our innovative and sustainable new resin dispersions for the aqueous printing ink market. The presentation will be given at the accompanying congress on Monday 18thMarch, Session 5.3/Printing Inks from 11.00 to 11.30am. Learn more about the greener way we are offering your process. High bio-renewable alternatives to acrylic emulsions have been sought after in the aqueous printing ink industry during the last decades. Through a unique process, Lawter has developed rosin resin dispersions to satisfy this need. The purpose of the present paper is to detail the properties of our rosin dispersions and subsequent application testing. Formulations containing rosin dispersion solely and in combination with acrylic emulsion were investigated. Both aqueous inks and overprints were studied on several substrates, including PE, PP, polyester, and PVC films. Typical properties such as gloss, adhesion and block resistance were measured. Results revealed that our rosin dispersion showed an increase in gloss along with comparable adhesion on non-absorbing substrates. Besides its high renewable content (>75% in dried film), our rosin dispersions presented many performance attributes similar to acrylic emulsion. Hence, our new product represents a green alternative to contribute to the ink market sustainability. 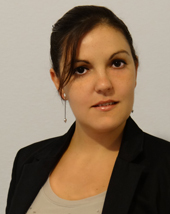 Maria Eva Ramos received her PhD (UBA 2009) working on advanced carbon-based materials. She has published 9 articles in international scientific journals and participated in more than 21 international congresses. She has been part of the R&D department at Lawter since 2010, developing resins for printing inks.